That's all from me today, but please return tomorrow to see the last of my teasers, along with the reveal of all the new products. I had a late night last night so I'm a little bleary eyed whilst typing this, please excuse me if there are more spelling and grammatical errors than usual! I'm usually a tea drinker, but I think I'm going to make myself a strong coffee this morning. A big hit of caffeine is just what I need to kick start me today! Welcome back to day two of the September Release Countdown Teasers, I'm so pleased you decided to pop by, thank you! My husband has meetings in London's West End today so I think I will tag along and do a little window shopping before meeting up with him for lunch. We have date night tonight (dinner followed by a comedy show), so may as well make a day out of it! Welcome to Rubeena’s Crafting Anniversary 2-Day Blog Hop! This hop is epic with more than 70 guests and over $1,000 in sponsored prizes! 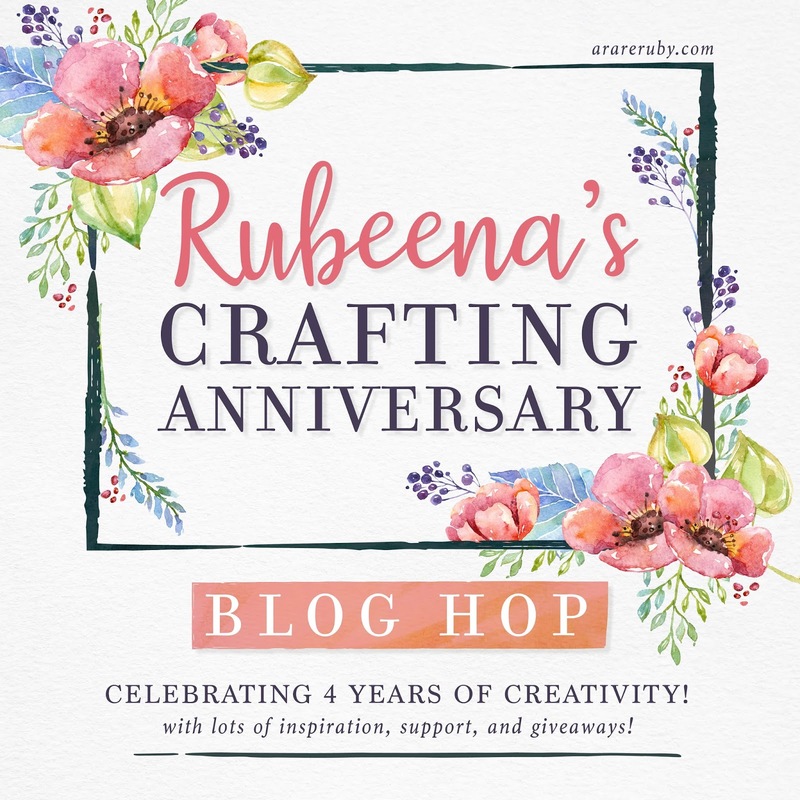 Not only are we celebrating four years since Rubeena first discovered cardmaking, but also crafting in general. This industry is made up of wonderful individuals who are creative, inspirational, kind, and incredibly supportive! Hop along so you can learn about why we create and how much joy it brings us! I can't tell you how thrilled I am to be part of this amazing hop, Rubeena is such a wonderful lady who has always been so incredibly supportive, and her kindness is second to none. Congratulations Rubeena on your crafting anniversary and thank you for letting us celebrate with you! In celebration of this anniversary, we have several amazing sponsors Winners will be randomly selected from comments left on all the blogs. The winners will be announced by Wednesday, September 5 and will have up to 2 weeks to contact Rubeena at ararerubycrafts@gmail.com to claim their prize before another winner is selected. I spent yesterday playing with Halloween stamps, not sure what I'm going to do with all the cards I made though! We're heading into London's West End, staying at our favourite hotel, for the long Bank Holiday weekend and I'm very much looking forward to it! I am absolutely exhausted, having spent a couple of days at Alton Towers theme park, apparently I walked 15 miles this weekend...which is more than I usually walk in a year ;) hahaha! I hope you had a great weekend and that your Monday is fantastic too! Well, it looks like the sun heard all my complaining about the excessive heat and has disappeared, making way for the downpour of rain, just in time for my weekend away at Alton Towers...serves me right ;) haha! Thanks so very much to the few of you who still take the time to visit my subpar blog, you are truly appreciated! Labels: Feeling Fruity, Say What?